As per a new report just increasing the immigration cannot solve the problems of economy and demography in Atlantic Canada. The actual challenge is retaining the Immigrants. A discussion on the report, named ‘The People Imperative’, was held and it resolved that more attempts must be made for retaining the immigrants in the region. The four provinces comprising the region - Nova Scotia, New Brunswick, Newfoundland & Labrador, and Prince Edward Island – have the great economic impact owing to an aging population and diminishing labor force. With Increased immigration, one can tackle the problem, but when the permanent residency is attained, a newcomer has the freedom to reside anywhere in the country. Many immigrants take a decision to leave the area and join better provinces. From 2011 to 2015, Nova Scotia managed to retain 72 percent of immigrants, and Newfoundland & Labrador could retain 56 percent in, New Brunswick 52 percent and Prince Edward Island merely 18 percent. Other provinces in Canadian had a retention rate of above 80 percent. The report was created by the Ottawa-based Public Policy Forum and has called for a direct action. In order to retain the immigrants in rural provinces, the present lawmakers must think in an innovative manner. There must be a coordinated thinking across all levels of government for a positive result. The policymakers must create the right conditions and take several measures in the interest of the immigrants so that they remain in the region. 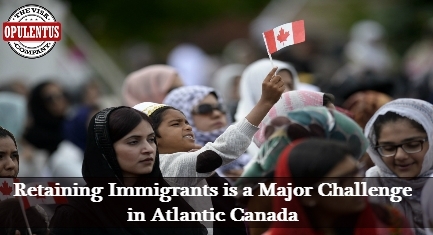 The immigrants serve as an effective tool to overcome increasing demographic challenges, and policymakers of Atlantic Canada need to consider the incentive-driven approach. There must be an input from all the stakeholders in creating better conditions for immigrants so that they remain in the region. If this strategy is adopted, it will immensely help, to ensure the success of immigration policy objectives of Canada. The matter is not clear if the federal government can enforce a legal way to ensure that the immigrants take up residence in a particular province or area. For allowing the court to permit such a limitation, the issue of a chronic labor shortage in a few areas has to be shown to pose a threat to the future of such areas. Through this way, the court can be convinced regarding the significance of the issue. In case the restriction is temporary in nature and not tough on newcomers, there is a possibility that the court will allow it. Opting for a new immigration program or stream exclusively with this aim can counterbalance these concerns. Immigrants need to be asked to live in specific areas, and as a result, they can be given an enhanced chance to gain permanent residency, in a fast manner. All these options face the major hurdle of the constitutional right of permanent residents to have free movement. The employer-driven Atlantic Immigration Project has an aim to attract 2,000 additional immigrants annually to the region. This figure is likely to increase in case of the existence of demand, with an immigration plan to have 4,000 newcomers at the end of 2020. The specific needs of the candidates have been addressed through the settlement plan, and every job offer needs a provincial endorsement. It works with the aim to bring well-equipped newcomers who can stay and settle in the region with their families. Atlantic Immigration Pilot has the following three Programs of Atlantic High-Skilled Program, Atlantic International Graduate Program, and the Atlantic Intermediate-Skilled Program. The norms of work experience, job offer, and education, of a candidate, depending upon whether he/she is applying in the worker section or for an international student graduate. The other norms are similar for both. The norm is working must be for at least one year -1,560 hours totally -30 hours per week, during the previous three years. · In the High-Skilled Program, workers require one year experience at skill type/level 0, A, or B. · In the Intermediate-Skilled Program, workers require one year experience at the skill level C.
· The experience can either be gained inside or outside the country. Candidates do not require work experience. Candidates need an Educational Credential Assessment to ensure that it is valid and equivalent to a Canadian credential. · Have a visa/permit for working or studying/ training in Canada. A candidate is ineligible in case the scholarship/fellowship demands him/her to return to the country of origin after completing graduation. Note: The candidates can apply to seek a temporary work permit in case the job has an urgent demand. When the employer wants a candidate to apply for work permit a temporarily the candidate must apply for PR within 90 days of submitting the temporary application. A candidate with a job in the other occupations in the past is also eligible. The candidate is not required to meet employment norms for the job, as listed in the NOC. The employer is not required to have an LMIA. Every province will notify a list of employers for hiring in the Atlantic Immigration Pilot. Candidates must have a Score of level 4 in the CLB exam in English or the Nivea de Competence Linguistic Canadians in French. The Results must be recent(less than 2 years) on the date of submitting the application. Candidates must show that they possess sufficient money for supporting self and family after immigration. The Amounts are different as per the size of the family. No Proof is needed when a candidate is previously living/ working in the country and has a valid work permit. A candidate needs to undergo a needs-assessment prior to immigrating. After it is done the candidate receives a plan with details regarding the community where they can move and get help after arrival. Employers need to complete an Endorsement Application for every candidate eligible to fill up an existing vacancy. Candidates cannot apply to IRCC without attaching an endorsement, where the particulars of the job offer and settlement plan are included.